I will include links below for the items used from Noor Design Uk. How scrumptious! I absolutely love it Judy! You would never know you had used up scraps either, I can't say enough how beautiful it is! 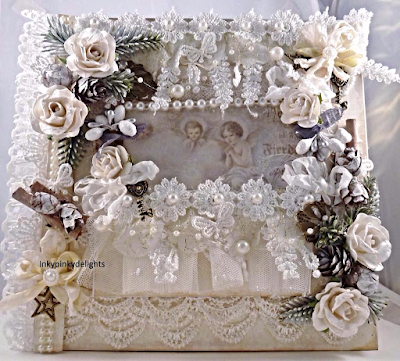 WOW Judy you have done it again another stunning card it is out of this world I love the design and all your embellishments are beautiful. Beautiful design and all of the wonderful lace lends such an elegant feel! Wonderful use of the pinecones and all the tidbits! Awesome sauce and fantabulous! Judy very elegant laces again. I love the arrangement with them and flowers too. Fantastic and elegant design.